During the visit of Don Sebastian and Don Hernan this October, I had the wonderful possibility to spend some time with Don Hernan. The wisdomkeeper Don Hernan from Chinchero, Peru, shares his insights about the global challenges we face and brings in a deep healing understanding of delevoping self love as a base of global change. Don Hernan, you were coming here to Europe as a Pampamesayok. Panachay (Sister). Yes, I come here to Europe as a Pampamesayok, caring my tradition, my Incan Tradition. And why are you coming? Well, I am coming because the people here in Europe were calling me. And of course there is a need of bringing a change to the people, to learn to love nature, Pachamama and also to learn to love themselves and then also everybody else. And what is the most important observation within the people in Europe- what is it, what they need, apart from contacting more Pachamama and nature? Well they have a different cultural backround, other habits other tradition, but what I am definitely observing with the European people that I meet, is a kind lack of love and what I very often observe is that the Boss of all is the clock, the time. Contrary to us, we forget often about the time and allow that the things flow by themselves. So, you mean it is about the flow- to let things flow and let them flow to find out how things want to flow? Exactly. This is what I want to say. One point is, that things always flow by themselves and the other point is, how do you want things to flow. Not only in you, in your body, but also in the society. So you cannot control, what we think all the time? So earlier, when I was a child the time felt like eternity for me that never would be over. Today the time is our worst enemy. Everything is at certain time, what we need to do at which time so the European people have a lot of stress now. The majority or maybe 50-60 % that I observe suffer from stress as a consequence of the life rhythms they live, the jobs – everything very hastily or rushed. Do you think it is also an effect of all the possibilities we have here? Do we have to make more priorities or even decisions? Like a kind of confusion the people have – not to know what to choose from all the big possibilities we have? And this could cause also the stress with the time. What you think? On one hand yes – the European world for many people and also emigrants opens up a world with a lot of possibilities and options to make your live more prosperous. That it feesl better. But this is the material part. But what is about you? What about you as a person? All these possibilities are very welcome when you are happy with yourself, what you do, how you are and how you want to be. There is a difference between “How am I” and “How I want to be”. What I notice also as I am organizing events with the Paqos, that this tradition has a very big support. 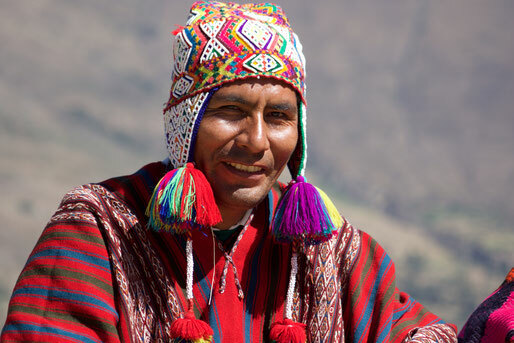 Many Paqos from Peru travel all around the globe. It is very big, kind of new Buddhism to say. What do you think about the importance of this tradition. Has it a special message for the world? Well, the global message, not only from me, but from the Incan tradition, because as you say not only we travel, but many of us, of the Paqos, are bringing the wisdom of our ancestors. They show, what is the most important wisdom and this is the munay- the unconditional love. Because I think here in Europe they have forgotten this. Because of this we are cultivating this to the whole world not only to the people. Our Intention is that the wisdom of this tradition that we transmit to the people, helps the people to learn the munay that existed in the past times of the Incas. This is the most fundamental part, the main principal for a person, so that he/she can expand his/her thoughts, goals and work from this munay. Here in Europe they often close their hearts to themselves, so you live in your own small world, your personal small world. But you do not open to the others parts. And what we observe is that we harm not only other persons, but also nature with all the technology. Not only here in Europe, in all the big countries with big potential of technology. But this technology is not only helping us. It helps also to destroy ourselves. This is what happens with the wars, with the big nuclear weapons they have. It is our own destruction. So our tradition is simple, frugal. We do not think in big things, but we are happy. And what do you do, if you hear or see news in TV or in the newspaper about the cruelty, the wars and the destruction in the world? How do you personally handle this? We work with the cosmos, with the energy, so we always try to balance these types of imbalances. For example every year on august the first in the Andes is a big thanksgiving, because it is the day of Pachamama – I think similar kinds of days are existing all around the world - and we make a big offering. This offering is not only material, but also an offering by your intention, by your power, by your heart. This is what I want to say. Because of this we make these kind of balances, so they may bring a bit more balance in the world, so that all these forces are not in such a big imbalance. But the true solution is, when you give thanks to your earth mother in your best moments. So it is for the balance of the whole world, but also for yourself personally, because you may also have emotions? Logically, yes. What I want to tell you, is that this needs to come from you. Being done by you. How can I say to you that I love you, if I do not love myself? This needs to be going back to you. Let´s bring an example - How can you say you love the sun, Inti Tayta, and when it shines you use a parasol to cover yourself? So we sometimes try to show, well I cannot say I will show you to love, it is allways about you to learn. But we can give you some tips, but you have to learn to love yourself. There is nothing more I can do for you. Honestly. It is like showing a child to walk. When it starts to learn to walk it first holds your hand. But from there on, it needs to learn by itself. I know it will fall and also cry, and it will learn from this. But if you do not allow to it fall until it is older, it will effect it. This is how it happens in life too. I need to learn to love myself how I am. Of course I have my faults, and also my virtues but I have to enjoy more my virtues than my faults. This is the position you hold for yourself? How you see yourself? Yes, for myself but this is also the vision I hold for everybody else. Of course from there it is giving birth. It is giving birth by you, then it touches other people. If you contact from your heart with a look sincere, with a smile sincere you can reach out to other persons. If someone is sad you will change the energy of this person. My last question is, what can you advise us in Germany, in Europe, how can we start to love ourselves? This is a very good question. For some of you the life is so beautiful, for some very complicate and for some just simple. For everybody who wants to learn to love themselves, I advise to learn to love Pachamama. She is everybodies mother. So we may not harm her anymore. Because if you harm another person or another village, you harm nature too, because there is an imbalance in the persons energy. It is all about this unconditional love- the Ayni – it is a sacred word for us if you talk about Ayni. Ayni means reciprocity. But you can talk about Ayni in a very big way. You can interpret it the way you agree to this word. Ayni was very sacred for the Incas and also a key-word. Because Ayni was not only a reciprocity like I give you and you give me. They did Ayni with Pachamama, with the Apus, with Inti Tayta. This was the biggest Ayni. But now you ask, how can I do this Ayni with Pachamama? It is the connection to mother earth, in the moments, when you are in your highest prosperity. And then you say thank you to Pachamama. Not only in the moments of need. This is a difference. When something happens to the people, they have to call the Paqos, the doctors, or somebody else who may give them some kind of solution. But the true solution is, when you give thanks to your earth mother in your best moments. Because this is the energy with the most flow. So then Pachamama will renew yourself every day more- she will give you more power, and this inner power is always connected to the mother, no matter what is happening. I don´t want to say that the whole life is colored in rose, how we often believe, but you need to learn to walk the most happy, most fertile and most fructuous way. Sumaq- Urpichay Sonqoy- this words will help many people.